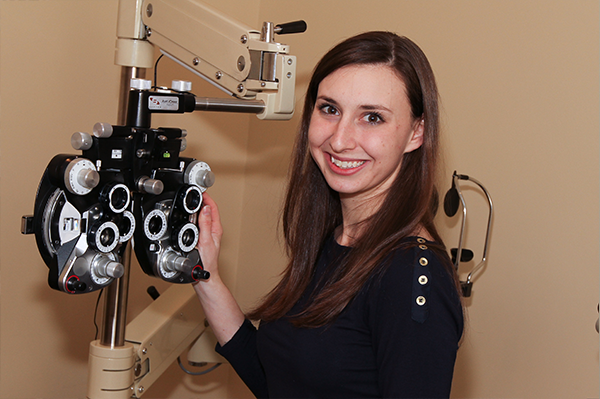 We provide comprehensive eyecare for the whole family, from kids and teens to adults. We take pride in our personalized approach to vision care. Our reputation has been built on our relaxed and thorough approach toward the visual needs of our patients. We realize the importance of listening and we take care in explaining the examination results, diagnosis and treatment options clearly and completely. We are State Board Certified to diagnose, treat and manage conditions and diseases of the eye such as glaucoma, cataracts, dry eye, conjunctivitis (pink eye) and ocular injuries (corneal abrasions and foreign bodies) in addition to comprehensive annual eye exams, glasses and contact lenses. Regular eye exams are an invaluable tool in maintaining healthy eyes by detecting and preventing disease in both adults and children. Some diseases develop slowly without causing pain or vision loss. Early detection of any problems can reduce the risk of further harm and allow for a choice of treatment options. Part of your exam includes the following procedures: Slit Lamp Examinations, Dilated Eye Exams, Refraction for Glasses and Contact Lenses and Glaucoma Pressure Testing. Our approach to examining the eyes and vision of our younger patients is to keep their visit lighthearted and fun! We want to insure the good sight, vision and eye health for the rest of your child's life and we take a preventative approach to his/her general health and eye health. We will work with your child's primary care physician to help keep his/her eyes healthy. It is important that all of our pediatric patients have healthy and efficient visual systems to help make visual demands of learning in school easier and fun. Cataracts are the clouding of the natural lens inside of the eye causing blur and glare as they progress. We monitor and evaluate for cataracts and if treatment is necessary, we work with surgeons to co-manage cataract pre-surgical and post-surgical care. Dry eye is a condition where there are inadequate tears or the quality of the tears prevents them from staying in contact with the cornea. Dry eye can cause gritty, red and irritated eyes and can possibly damage the cornea of the eye. Treatments often include stabilizing the tearfilm to allow increased tear contact time with the cornea. Our office utilizes advanced computerized and scanning laser technology in the evaluation and treatment of eye diseases including Heidelberg Retinal Tomography (HRT) for the evaluation of the optic nerve in glaucoma and other diseases, Humphrey Threshold Visual Field Analyser for the treatment and detection of visual field changes found in glaucoma and neurological disorders, Retinal Camera to document retinal changes and corneal pachymetry which uses ultrasound to measure the thickness of the cornea. In addition, we utilize electronic health records computer system to document your exam results and provide our patients results and other information through an on-line patient portal. We evaluate and treat eye emergencies including ocular injuries (corneal abrasions and foreign bodies), conjunctivitis (pink eye), flashing lights and floaters and other emergent symptoms. If you have an eye emergency after normal office hours, please call our paging service at (973) 507-1061 and your call will be returned. We have been working with local LASIK surgeons for many years to provide pre-operative and post-operative care for patients considering corneal refractive surgery. We will discuss your visual goals and evaluate your eyes to determine if you are a potential candidate for refractive surgery and which options you have. For patients who proceed with LASIK or other refractive surgery, we work closely with the surgeons to provide post-operative follow-up care. More and more of our time is spent looking at computer, tablet and smartphone screens causing many people to experience visual discomfort, headaches, eyestrain and dry eye symptoms. Annual eye exams and special prescription lenses may help many to minimize these symptoms. Excellent visual performance is much more than just 20/20… smooth and accurate aiming and focusing skills are essential for optimal visual performance. The American Optometric Association estimates that 20% may have an undetected functional vision problem. Vision therapy is a non-surgical treatment program which can help treat eye turns, double vision, focusing difficulties, eye aiming and “lazy eye”. Whether it’s working to eliminate skipping lines or some other obstacle for reading and school work or getting that extra edge for playing sports, vision therapy may be able to help. We’ll take the time needed to solve complicated and challenging contact lenses using innovative contact lens designs that will best fit your visual needs and your lifestyle. We offer bifocal/multifocal contacts, lenses for astigmatism, and specialty lenses for certain eye diseases. With hundreds of designer frames in the latest styles and fun and popular frames for kids, we’ve got something for almost every style and every budget. Today there are hundreds of high tech lenses available to provide excellent vision and protection from harmful ultraviolet rays and annoying glare. We’ll talk with you about how you use your eyes and give you the options that are best for you.